A small boutique hotel with 11 comfortable bedrooms. 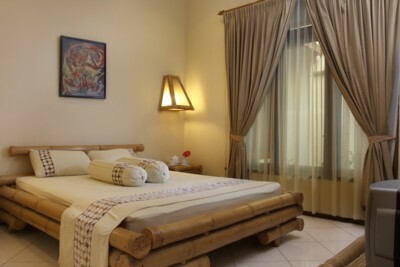 Equipped with airconditioner, cable TV, hot & cold water, the rooms are designed using modern Javanese atmosphere. 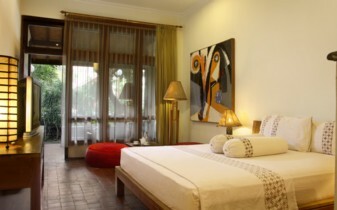 We have standard, superior and deluxe rooms. Our deluxe rooms are more spacious (38 m2) with a private terrace facing the tropical garden & swimming pool. Other facilities are garden restaurant, free hot spot, car rental, laundry service and taxi service. We accept Visa Card and Master Card. Tax, services & breakfast are included. For International visitors: A credit card is required to secure your reservation at Rumah Mertua Boutique Hotel, Garden Restaurant & Spa. If the reservation is not cancelled outside of the 2 days cancellation notice period, your credit card will be charged with the full amount of the first night´s stay unless otherwise stated in the room notes. This email should arrive within 24 hours of requesting a booking. For Indonesian visitors: A deposit of one night paid direct to our bank account is required to secure your reservation. We will provide bank account details when your booking is confirmed, This email should arrive within 24 hours of requesting a booking. The room rates for Rumah Mertua Boutique Hotel, Garden Restaurant & Spa are the total price of the room and not the ´per person´ rate. All prices are inclusive of all local taxes plus breakfast.